WEDNESDAY, April 2, 2014 (HealthDay News) -- Spending time in the bright morning light may help you slim down, new research suggests. The small study found that people exposed to more light earlier, rather than later, in the day tended to be leaner than their peers. "We were very interested in looking at the relationship between lighting and how that may be affecting your weight," explained study senior author Dr. Phyllis Zee, director of the sleep disorders center at Northwestern University Feinberg School of Medicine in Chicago. "This is an early study, but we did indeed see a fairly robust association between the amount of light and the timing of light, and weight," noted Zee. However, she was quick to point out that the study only found an association between early light exposure and lower weight, not a cause-and-effect link. The study included 54 adults. Twenty-six were male, and the average age was 31. A special monitoring device -- worn on the wrist -- measured light exposure, sleep mid-point and duration of sleep for seven days. Weight and height were self-reported. The researchers calculated body mass index (BMI) from those self-reported measurements. BMI is a rough estimate of a person's body fat. The participants also kept food logs during the seven days they wore the monitoring device. Zee said the strongest association was seen in people exposed to light that was at least 500 lux, which is the equivalent of a well-lit indoor room. 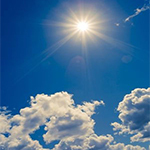 Outside on a sunny day provides 1,000 lux or higher, while most indoor rooms are about 200 to 250 lux, according to Zee. But, the timing of the light also mattered. Those who were exposed to brighter light earlier in the day were the slimmest. "For every hour later in the day that you reach 500 lux that translates to an increase of 1.28 BMI. The earlier the light exposure, the lower the BMI," said Zee. There are a number of ways light might influence weight. One is by altering circadian rhythms -- the body's internal time clock -- to allow for better sleep. Morning light might also affect hormones that influence appetite regulation and metabolism, Zee said. Even after the researchers controlled for other potentially slimming factors such as caloric intake, sleep duration/timing and the possibility that people getting early light exposure might be more active, light exposure still seemed to account for 20 percent of BMI, according to the researchers. Does that mean people who live in sunnier climates would be thinner than their colder counterparts? Maybe, said Zee, though they didn't include such a comparison in the current study. "People tend to lose more weight in the summer, when you're getting more light earlier in the day," she added. Zee recommended between 20 minutes and 30 minutes of bright morning light between 8 a.m. and noon. "Whenever possible, be exposed to early light," she said. "Walk to work if you can. Bright, outdoor light will be way above the 500 lux. If you can't get outside, work near a window. If you can't get near a window, at least make sure your work environment is well-lit," Zee added. Jaclyn London is senior clinical dietician at Mount Sinai Hospital in New York City. She said that the "researchers raise an interesting question, but the study is very small and relied on self-reporting of diet and weight. There was no study intervention either, so they weren't able to prove causality," London noted. "However, I do think there's some evidence here to suggest that the impact of light may influence metabolic changes and possibly play a role in BMI. And, with 67 percent of Americans being overweight or obese, it's certainly an intervention worth looking at," London said. The study was published April 2 in the journal PLOS One.